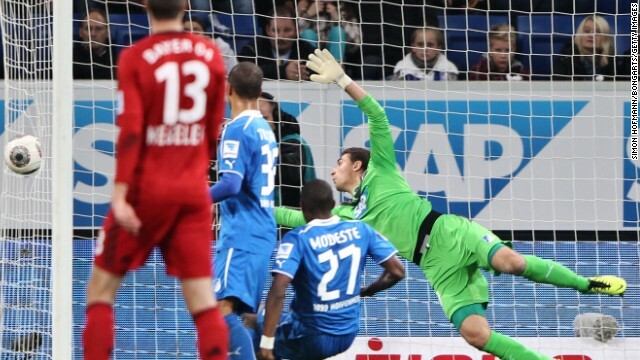 Stefan Kiessling was awarded a goal against Hoffenheim even though his header went in through the side netting. (CNN) -- When he digests all the evidence, referee Felix Brych -- who is also a lawyer -- will probably admit he got things wrong in a Bundesliga football game Friday. Brych awarded a goal to Bayer Leverkusen's Stefan Kiessling in the second half even though replays showed that the forward's header against home side Hoffenheim went wide of the post and crept in through a hole in the net. Kiessling put his hands to his head as he thought he spurned a good chance and couldn't quite believe it when the goal was given. It turned out to be the winner in a 2-1 result that sent Bayer Leverkusen to top spot in the league, two points ahead of idle Bayern Munich. Afterwards, Brych spoke and said his hands were effectively tied. "There was no indication that it was not a regular goal," Brych was quoted as saying by Britain's Daily Mail. "I had a bit of doubt, but the reaction of the players was clear. There was nothing to suggest otherwise." Kiessling wasn't sure how to react. "Everyone started rushing towards me," he told Sky Germany. "What could I do? "Honestly, I couldn't really judge what I saw but when Hoffenheim pointed to the hole in the net, I had an inkling." Hoffenheim manager Markus Gisdol wants the game to be replayed, citing a similar incident between Bayern Munich and Nuremberg in 1994 when Bayern's Thomas Helmer scored a 'phantom' goal. Having won the controversial game 2-1, they indeed replayed the affair and Bayern cruised 5-0. "If they do not repeat the game then I don't understand the world of football anymore," Gisdol told Hoffenheim's website. Added Hoffenheim managing director Alexander Rosen on the Hoffenheim website: "It is unbelievable ... what happened here today." Miralem Pjanic's week just keeps on getting better. Part of the Bosnia and Herzegovina team that qualified for the World Cup for the first time, Pjanic scored both goals as red hot Roma stayed perfect in Serie A by beating second-place Napoli 2-0 on Friday. Pjanic netted the opener in first-half injury time on a free kick and got the second from the penalty spot in the 71st after Napoli defender Paolo Cannavaro fouled Marco Borriello -- who came on for injured Roma legend Francesco Totti. Roma rose to 8-0-0 in the Italian top division and has scored 22 goals while conceding once. Despite the sizzling start, Roma only has a five-point lead over both Napoli and two-time defending champion Juventus. Juventus can cut the gap to two points with a victory at Fiorentina on Sunday. Rafael Benitez's men, watched by former Napoli great Diego Maradona, made the better start in Rome and some would feel deserved better. Lorenzo Insigne's pass put Goran Pandev in the clear but his shot was partially stopped by ex Napoli keeper Morgan de Sanctis and then cleared off the line by Daniele De Rossi. Insigne struck the post and Napoli paid the price for missing the two opportunities when Pjanic deposited his free kick into the top corner. Cannavaro gave away the free kick, taking down the resurgent Gervinho. Napoli struck the woodwork twice more early in the second half and its night got worse when Cannavaro tangled with Borriello. Pjanic sent Pepe Reina the wrong way for his third goal of the campaign.